West Indies 335-4 (Darren Bravo 112*, Dwayne Smith 96, Paul Stirling 1-26) beat Middlesex 107 all out (Josh Davey 24*, Dawid Malan 21, Chris Gayle 2-0) by 228 runs. The West Indian batsmen, led by a ton from Darren Bravo, warned England of their intentions in the ODI series by crushing Middlesex in the only warm up match. West Indies hammered 335 runs for the loss of just four wickets in the allotted 50 overs and Middlesex was bowled out for 107 mere runs with 19 overs to spare. The only One Day International tour match was played on Wednesday, June 13, 2012, at Lord’s, London. Earlier, the captain of Middlesex, Neil Dexter, won the toss and put the Caribbeans in to bat. The innings was initiated by Lendl Simmons and Chris Gayle in an attacking mode as the ball was sent out of the ropes many times. Gayle was the most attacking of the two and the first fifty of the innings was scored in nine overs. The openers accumulated 55 runs in 9.5 overs when Gayle was gone after scoring 34 off 30 balls with 2 sixes and 4 fours. Simmons followed him 12 runs later at his individual score of 23 when Darren Bravo and Dwayne Smith joined together at the crease. Smith started attacking as Bravo kept on securing his end while keeping the score board moving rapidly. The first gathered 11 runs with a couple of fours in the 27th over and completed his fifty in the next over. The hundred runs partnership was achieved in the 33rd over as the duo enhanced the scoring rate by punishing the rival bowlers at will. Bravo attained his fifty in the 35th over with a four and they lifted the score to 223 in 38.5 overs as Dwayne Smith lost his wicket for 96 off just 81 deliveries which comprised 2 sixes and 10 fours. Dwayne Bravo joined Darren Bravo after the fall of the fourth wicket at 262 runs in 44 overs as the latter kept on creeping. They added 22 runs in the 49th over with one six and two fours as Darren Bravo attained his century in the last over with a six. 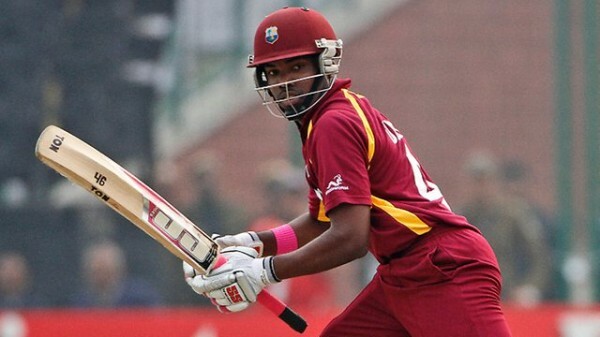 The 50th over produced 20 runs with 3 sixes as West Indies plundered 335 runs with six wickets in hand. Darren Bravo remained unbeaten for 112 off even balls with the assistance of 2 sixes and 7 fours and Dwayne Bravo stuck at the other end by scoring 40 quick fired runs from 21 deliveries with 3 sixes and 2 fours. Tim Murtagh, Anthony Ireland, Paul Stirling and Josh Davey were the only successful bowlers with one wicket each. Middlesex had a horrible start by losing two quick wickets for 11 runs in 6.4 overs as Dawid Malan and the skipper Neil Dexter tried to consolidate the innings by scoring a few boundaries. They took the score to 31 when Dexter was gone for 12 runs and Malan became the fourth victim at 63 in 17.3 overs at his personal feat of 21. The bowlers of the Windies became unplayable and they ripped through the middle order batting of Middlesex. The home side was reeling at 67-7 in 19 overs when Josh Davey and Tom Smith gave some resistance. They shared a 40 runs partnership as Smith was clean bowled by Chris Gayle for 16 runs. Davey remained unbeaten for 24 off 36 balls with 2 fours as the innings of Middlesex was folded back for 107 runs in 31 overs. Chris Gayle was the star performer with the ball by grabbing two wickets in the only maiden over he bowled. Ravi Rampaul and Andre Russell also claimed two wickets each whereas Dwayne Bravo and Sunil Narine shared one wicket each. West Indies humiliated Middlesex by a huge margin of 228 runs and showed a glimpse of their team work to England for the forthcoming One Day International series. The first ODI of the three match series will be played on June 16, 2012, at The Rose Bowl, Southampton.